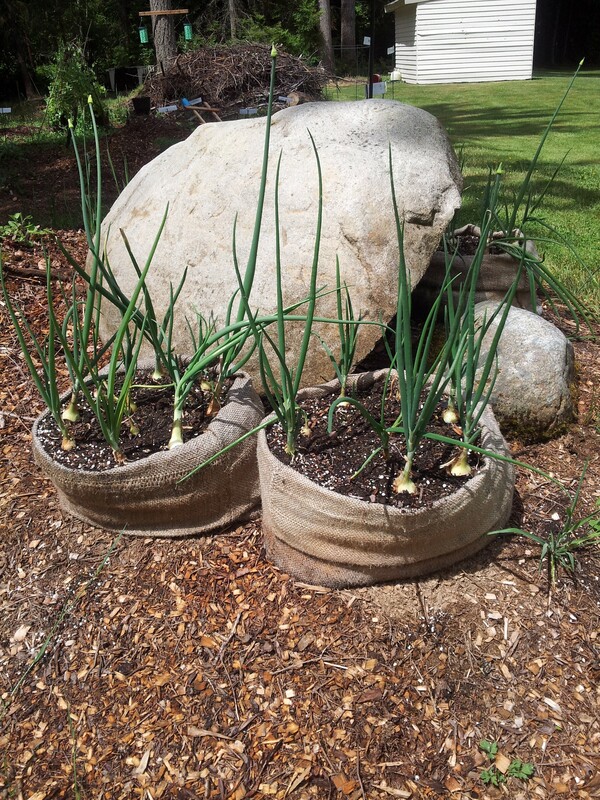 For the last couple months, I’ve been sharing topics related to Frugal Gardening. During the course of this series, reader Feline chimed in and told me she was successfully growing vegetables in burlap sacks! When she offered to write a tutorial and share images of her garden, I jumped at the chance! 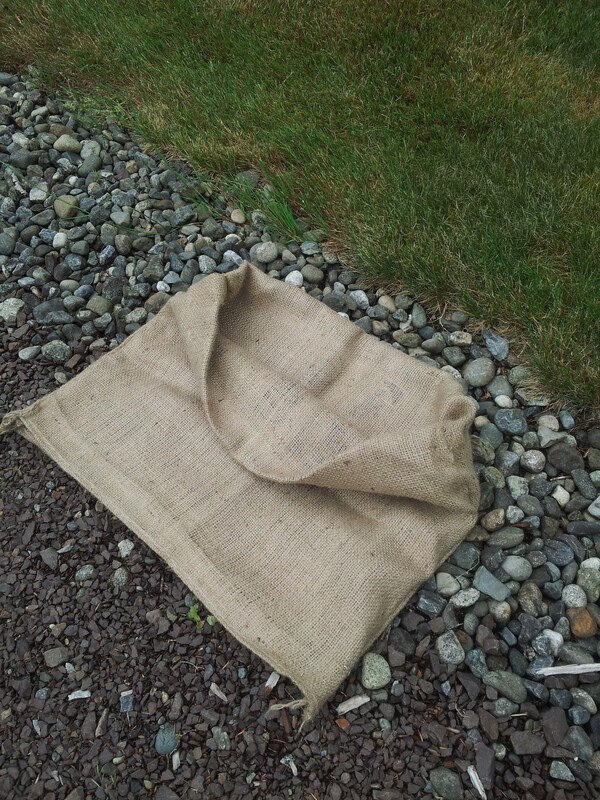 I get my burlap sacks for $1 at the Ace Hardware in Lake Forest Park Town Center. They have several locations. 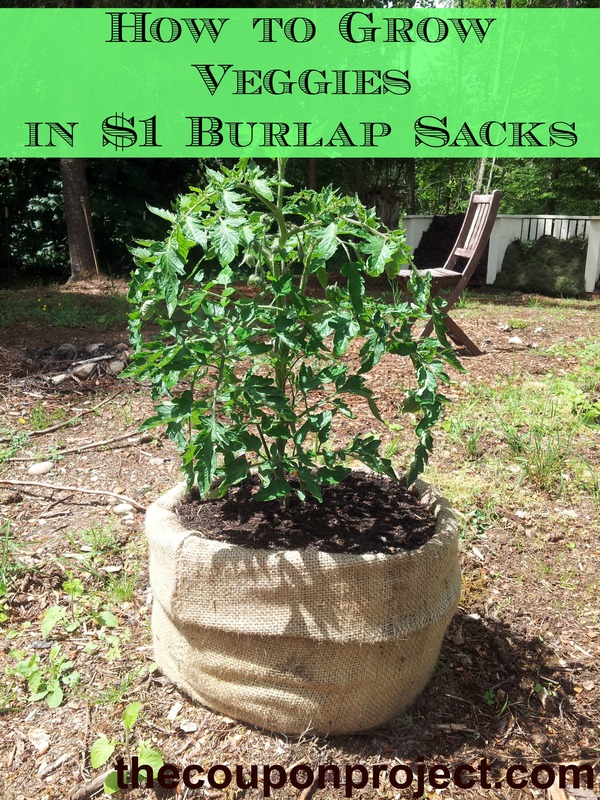 I’ve also seen burlap sacks at farm and feed supply stores or tack shops for just over $1 each. Look inside the bag and make sure the inside seam down the sides of the bag are clean (see photo in step 7). The top seam/opening doesn’t matter at all. Be careful, this stuff will get all over your knits! I bring in my large IKEA shopping bag when I buy them. Step 1: Plan your arrangement! Once the dirt is in, you won’t be able to play with it much, so it’s a good idea to lay out your sacks ahead of time so you know you’ll have good spacing. Step 2: Reach into the sack with both hands and grab the side seams about halfway down the bag. Turn the top half over to create a double layer of burlap. Make sure the top half is slightly longer than the bottom seam. Some bags have been cut along the top and this leaves a really yucky opening. It doesn’t matter at all, so just go with it. In the end, it’ll be tucked in. Step 3: Pull the bag upright, so the bottom seam is on the ground and pull the two sewn corners of the bag toward the center. In this case I untucked the corners for visual aid, but you don’t have to do this. It’ll look a bit sloppy, the ‘tidy’ will happen later. Right now, we just want to put it where it belongs and put dirt in. Try to keep the dirt off the walls of your sack, but don’t worry about it too much. I just pour until I can turn the bucket upside-down and slowly pull the bucket off. 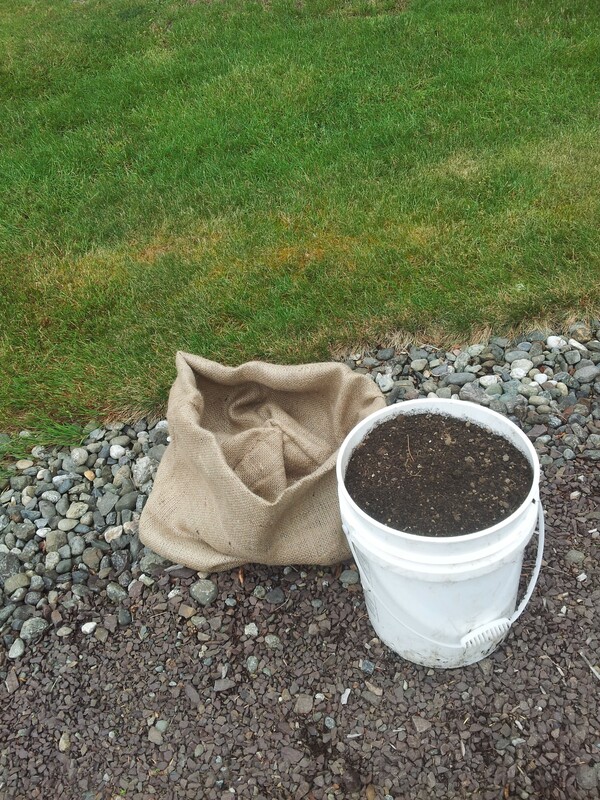 Don’t try and move the bag more than a few inches once the dirt is in. Step 5: Tidy up the sides of your bag. Tuck any loose ends in, and pull the side walls taut. Shape the bag how you want it. I usually aim for as close to a circle as I can get…but you can also square it off or stretch it into an oval. It depends on what you’re planting. At this point, your burlap sack is ready to go! 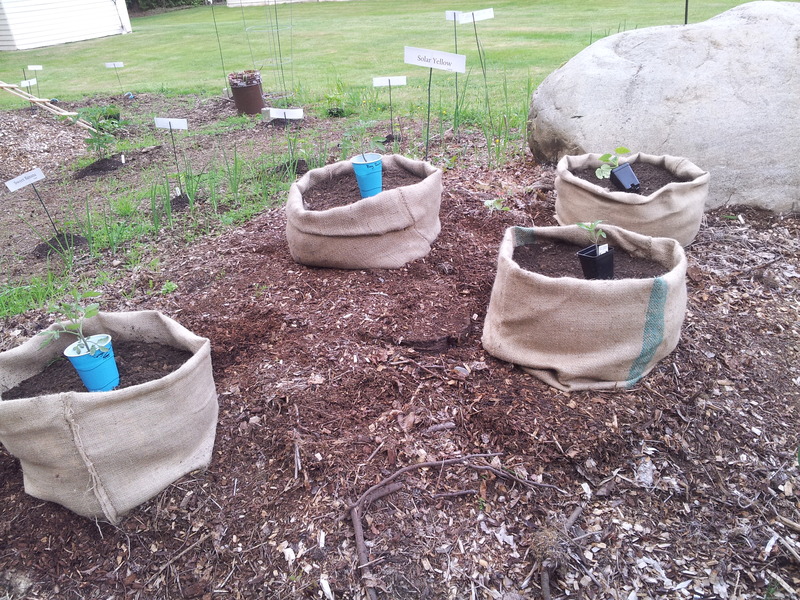 Here are some tips for planting in your new burlap sack raised bed garden! Fill them up with more dirt and plant anything you want. If you’re planting very young tomato plants, don’t add more dirt until they reach about 2’ in height, then pull off any low vines or leaves and bury the trunk in dirt/compost. If you’re planting older/larger tomato plants, plant as deeply as you can. 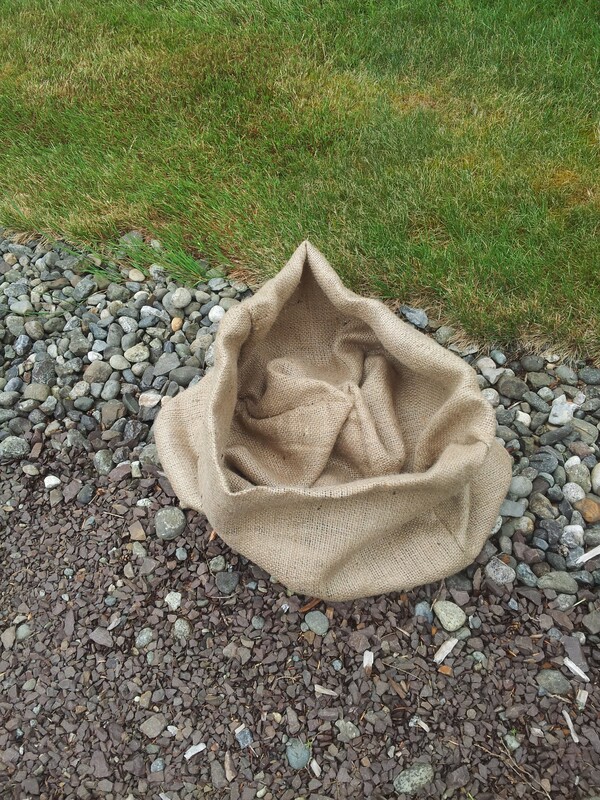 Once you water your burlap for the first time, you cannot move it at all. 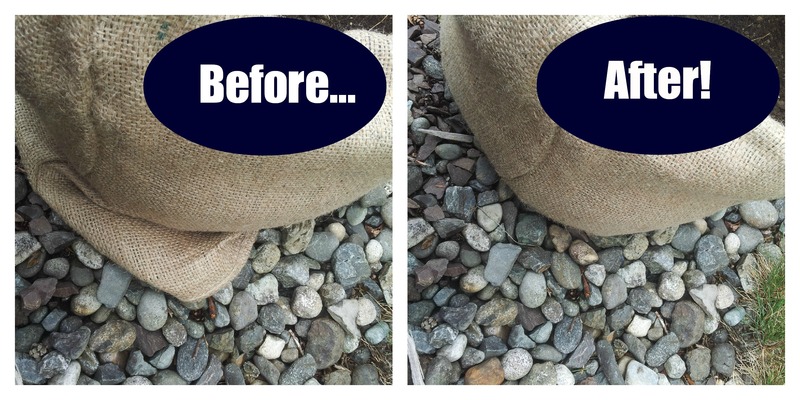 Your burlap should last the entire season no problem (double layer of burlap). 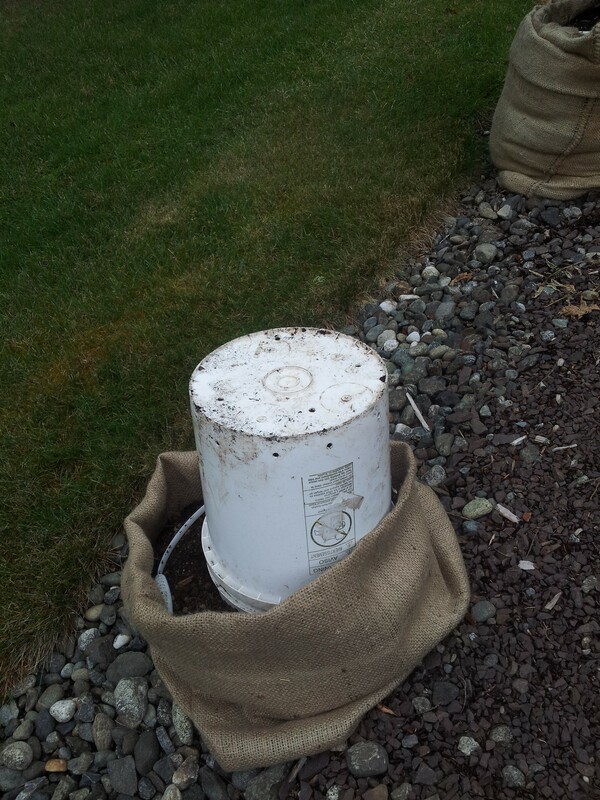 In the fall, you can throw your burlap sacks in the yard waste bin. Onions. I tossed these sacks together in like 5 minutes back in February. They’re still holding up just fine (yes, I know I need to cut my onions back). That was an experiment, and I hate it. 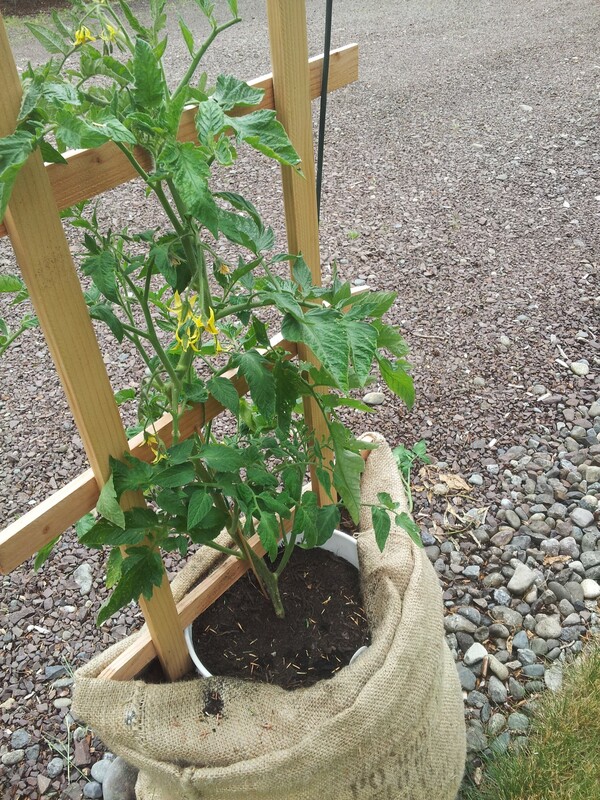 Those tomatoes are growing in a 5 gallon bucket that is inside the burlap sack surrounded with mulch.They look ‘slouchy’ and it drives me crazy. I like clean and simple, not slouchy! I would have pulled it all out by now, except those are my biggest tomato plants. Why I tried to fix a method that wasn’t broken, and do it in my driveway, I’ll never know! 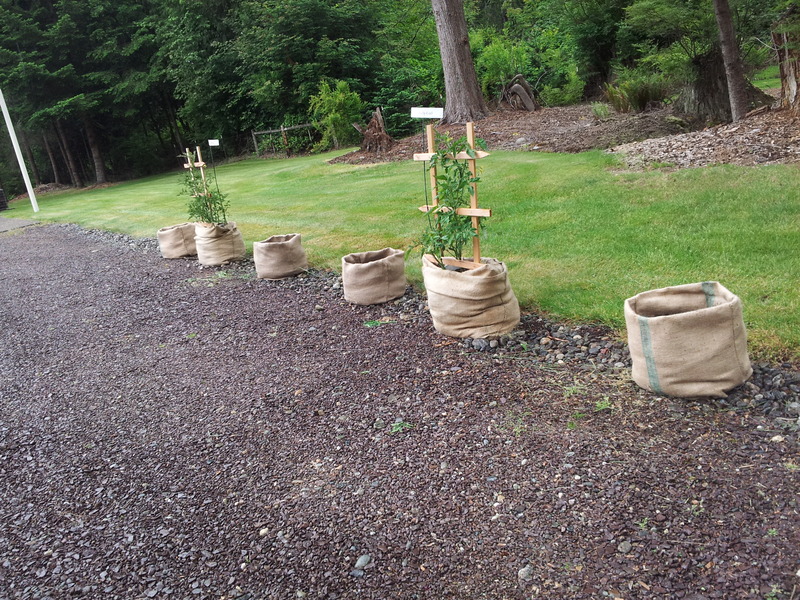 Thanks so much Feline, for sharing your fun and frugal method of gardening! I would love to know if other readers have tried this method? If this is a new idea, would you consider it? Looks super neat~~~ quick question, you mentioned cutting back your onions? This is my first year gardening and I hadnt heard about that. when and how far do you cut them back? I’m guessing she means to cut back the onion bulbs on top. If you look closely, it looks like they’ve started to bolt. Feline – if you’re around, can you clarify? Yup, they’ve started to develop seed pods. You want to try and keep your onion shoots about 2 feet tall. This height is plenty for photosynthesis (i.e. sun food for the bulb) but discourages seed production. You can eat your trimmings as green onions, yum! What a great idea! Thanks for sharing this! It’s an affordable way to do raised beds! thank you! Love it, thanks for sharing. I started a garden this year and my kids have really enjoyed watching everything as it is sprouting. We got a late start so I’m jealous when I see pictures of Feline and Angela’s garden but I’m sure it’ll catch up! We built our raised beds using untreated cedar fence boards ($1.88 each at Home Depot). 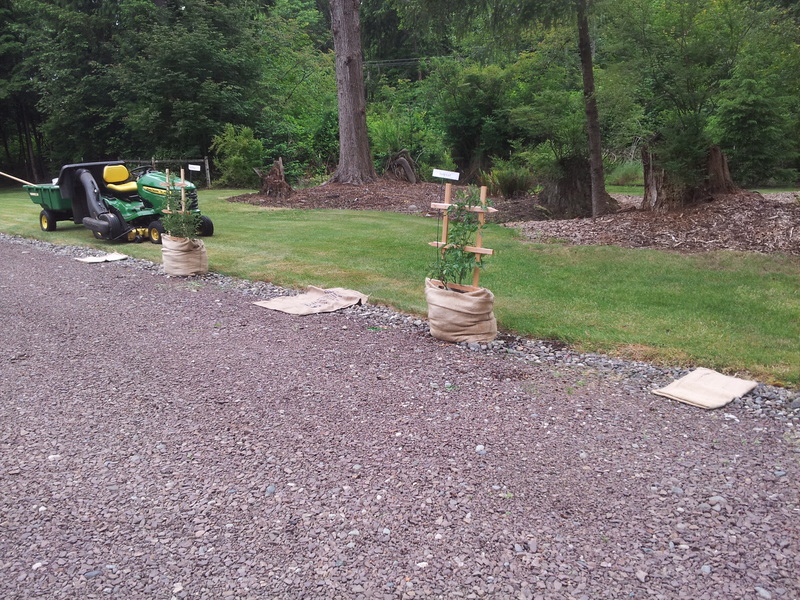 I have a few areas I’d like to plant some other items and the burlap bags will work perfectly! Happy growing. What are the dimensions of the sacks? The burlap doesn’t mold or rot? I’m so pleased this is stop up! We moved in 2014 and I’ve not had a proper garden since! 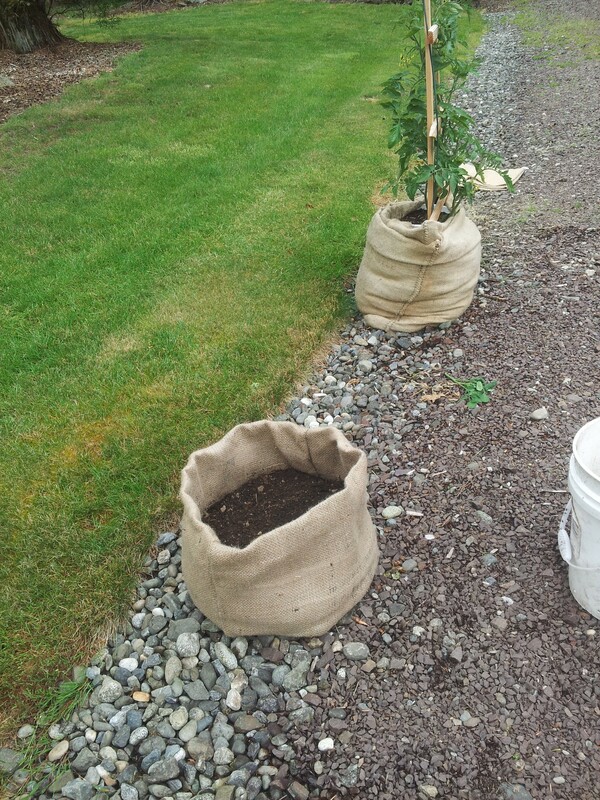 We just bought a house and planting at least a couple tomatoes was a priority so I gathered my materials and quickly realized I’m forgotten my method to make them look nice… Thanks!